There are three things that maps tell us when we view and interpret them. They tell us the physical make up of the earth or space about the center of the space being portrayed. They then provide us with insights into the relationships that exist between the objects on the maps and the locations to each other. Finally, they allow us to interpret whatever impressions we get when we view them, in search of meaning for those points, lines and figures portrayed. In the end, what we end up with maps is largely a consequence both an objective interpretation we make of the illustration lying before us, and our subjective interpretation of that map, trying to define what it means to us and why we are looking at it in the first place. We are always searching for some sort of reason for what happens in nature. Disease is no different. Maps provide us with the reasons such a thing as a disease or epidemic happens. And if we are confused about the answer to this question and still in search of some meaning, maps provide us with insights into the other roads to take to answer such questions. Maps can provide us with new reasons to pursue. However, there are cases in which maps aren’t the best way to find the correct answer. They can guide us to the final answer to our big question, but even a little bit of subjectivity and falseness at times can cause a map to guide us in the wrong direction. As explorers and travelers, we sometimes use maps to help explain an path that we decide to take, not guide us in the right direction through the abyss of knowledge needed to find the true answer to our questions. Robert Lawson produced the first map depicting and explaining the telluric theory of disease as a global phenomenon. The telluric disease states that the earth’s magnetic flux is capable of creating a unique “miasma” or phlogiston that is the cause for certain diseases that otherwise cannot be explained. With his map, Lawson demonstrated how the earth’s energy flows from south pole to north pole, something that seems to be common sense. But according to Lawson, it was that energy field that could cause certain diseases to behave the way that they do. It produces for us those things that influence the health of our body, increasing the degree of pathogenicity a natural object might have in the environment, turning it into a unique pathogen, and making some people become quite ill. The telluric theory claims that the earth as a whole, due to its energy in the form of magnetic-electric fields, can convert a disease like common cholera into the more fatal Asiatic cholera. Lawson based his version of theory on the findings of Michael Faraday, whose study of electricity and magnetism resulted in his claim that the earth had this natural force that was changed and modified over time by shifts in the earth’s crust and mantle. The flow of electricity within the earth, by way of a flowing metallic core, turned this planet into a large magnet. This is why the compass works, and why the earth’s magnetic fields seems to vary, flowing in various directions, with its north and south poles never staying exactly in one place. Lawson applied this theory to disease behaviors, and used the way in which disease seemed to flow over the earth’s surface to argue that it was behaving according to the earth’s waves (an Occam’s Razor effect). This theory had an impact on Lawson’s immediate followers, but conflicted too much with most scientists to develop much of a following. After just a decade, this theory took second stage to other disease theories out there. It was removed from any nosologies that inferred its existence once the zymotic and sanitation theories explained everything the pandemic waves theory could explain, as well as what it could not explain. This led the way to the final argument against Lawson’s theory for the upcoming decades, once the bacterial theory for disease came to be. 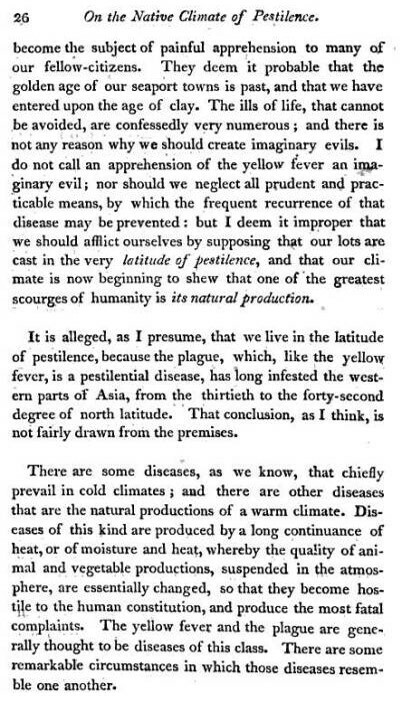 In 1814, an anonymous essay was sent to American Medical and Philosophical Register by an author who referred to himself or herself only as an “Observer.” This letter discussed the impressions the ongoing yellow fever epidemics had since it became a part of the rapidly growing country of the United States. The philosophy that led up to this letter was derived from beliefs once abundant in the early 1800s, when Noah Webster published his treatise on the growing number of epidemics worldwide. Webster claimed these were due to the population growth and economic expansion this world was going through, resulting in changes in climate and the migration of epidemic/endemic disease patterns to new places, causing new diseases to develop as well due to changes in our manner of living. Throughout much of this time, there was this new philosophy held by some which stated that changes in “disease type” were taking place as a result of changes in land use and our cohabitation with each other and with nature. As the places we chose to live in were modified, so too were the diseases they developed, and since diseases and climate were typically linked closely to each other, the prospects for the future at times looked bleak, as if Malthus’s claims from 10 to 15 years earlier were about to come true. An early rendering of what today we could very well consider a variation on the sequent occupancy and epidemiological transition theories was developed by Benjamin Rush in the 1780s. He introduced it to the field as a presentation given in England, in which he perhaps only in jest symbolically spoke about the growing communities and the different ways that people in these communities interacted with one other and the specific stages in living patterns, occupation and economic development that arose due to these changes. Each of the results he discussed referred to the development of new land use behaviors and changes in industry and business opportunities. Rush related these changes in place and occupation to what was happening in the United States since the Revolutionary War was over. Applying Rush’s concepts to medicine in the late 1780s and early 1790s, in light of what Noah Webster and the Observer had to say a decade or more later, diseases seemed to be progressing into new forms due to the ways in which man’s lifestyle changed. The kind of species mankind had become quite naturally grew and matured over time, going through not only changes in industry and technology, but also in how we produced our foods, engaged in outdoor activities, and made use of our natural resources and land. By 1800, a consequence of these changes was the development of more effective rapid shipping and communication routes, as the steamboat was born, and more immigrants made their way into this young country, and the introduction of yellow fever to this country on numerous occasions. At the time, we could not tell if this recurring yellow fever problem was due to local changes or foreign in-migration disease patterns. By 1807, the answer to this question was quite clean, and the first effective quarantine programs were established in this country. But global economy continued, and as a result global climate continued to happen. There were these numerous diseases people suffered due to the environment a person resided in or next to. This in turn came as a result of the miasma emanated by our from the damp soils and fields, or the local marshes, swamps, and lake edges. The humidity these settings produced in the local air made for some very serious cases involving fevers and catarrh. Severe diarrhea or dysentery was also abundant in these settings as were the annually returning diseases such as measles, mumps, scarlet fever, diphtheria and small pox. The idea that there is a Latitude of Pestilence in which certain diseases can either thrive or fail to exist became the standard for practitioners of medicine, who were learned in medical topography, medical climatology and medical geography as well as the natural and biological sciences we normally associated with medicine. This was not due just to the Observer’s letter. This belief was already a part of the physician’s repertoire for use whenever he tried to better make sense of certain diseases and their migration. To determine how specific populations were going to be so influenced by these diseases, we had to know the people as well as the ecology and behavior of the disease in relation to landforms and climate. The most important disease to strike at this time was yellow fever, and the country impacted by yellow fever the most was the United States. Being a disease of tropical origin, yellow fever was felt to favor warm to hot climate settings and so was considered endemic to these warmer climate settings in the Torrid Zone. For the Americas, there countries and landmasses included South and Middle America and the neighboring island settings. But it was also known that during the right months of the year, as the weather to the north approached summer, this disease began to make its way northward and finally reach the United States. It accomplished this whenever and where ever seasonal temperatures increased to match those of the tropics, as well as where ever the ships traveling northward away from the tropics managed to land due to their various commercial ventures. The observation of the relationships that exist between disease and temperature enabled doctors to consider these events consequences of annual thermal changes and wind patterns, properties which changed on a seasonal basis and to some extent seemed predictable. But some parts of these recurring behaviors were less predictable. These migrations were annual, but their exact pathways of travel were often unknown. We first had to better understand the time and space relationships between the equatorial line and the north pole in order to understand the disease latitude diffusion concept from hot to warm, to cold climate settings. But there was another idea developing at this time in the natural sciences that offered another explanation for this migration route. The earth’s magnetic field theory stated there was this interpolar migration that took place from south to north. 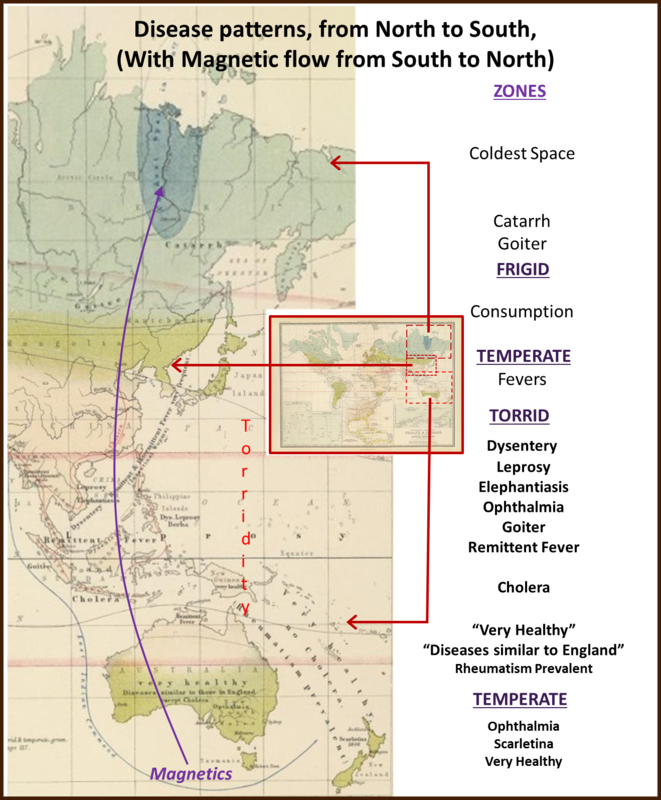 Unlike climate, which traveled away from the equator to each of the poles separately and in opposing directions, the magnetic field theory described this travel route to be unidirectional, from south to north. Combining these observations with those of the climate base latitudinal theory gave us a more complex theory to base our new disease discoveries upon. How such a theory for disease came to be–and how the flow of a disease from south to north via the poles came to be better understood–was through the work of Michael Faraday. Faraday related the discovery of magneto-electric induction seen with small objects to the earth as a whole. He termed the ability of the earth to produce its own magnetic field ‘terrestrial magneto-electric induction’ and went about explaining it using the earth’s metal core and its flowing nature as the foundation for this theory. This flow he claimed resulted in the polarization of the planet and thus its polarization. These effects were measurable by a compass, and whenever the location of the ‘north’ end changed, he speculated some internal force had to be changing as well. He drew up the “arcs” of these fields on the planetary surface, with ridges and valleys used to define the changes in their regularity across the latitudes of the earth’s surface. 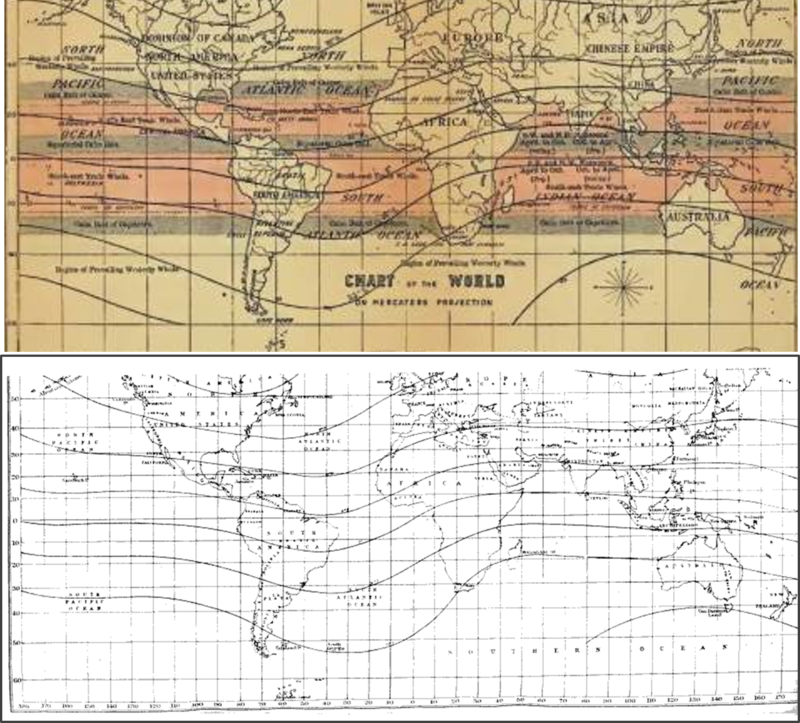 This isoline map was very similar to the basic climatic maps already developed, with lines varied as they crossed a continuous surface like the face of of land or the ocean, transitioning from one land surface type to the next, demonstrating fluctuations from the straight latitude-defined lines we might normally expect. It was these ridges and valleys that defined everything unique about certain parts of the earth’s surface. In a very short time, this philosophy transitioned into a form that was applicable to disease theory. The yellow fever epidemic years were 1793 to 1821 approximately. The geographic behavior of this disease was very topographic and climatic in nature. It could be easily explained using basic medical geography climate and latitude-longitude theories. Such was not the case for Asiatic cholera. Cholera (severe diarrhea) in general was endemic, even commonplace and perhaps a given pandemic disease concern. But its more deadly form, the Asiatic, spasmodic or malignant cholera seemed to go beyond the borders previously defined by the yellow fever diffusion patterns. this meant that there was something missing from the yellow fever medical geography derived theories. This also meant that more theories needed to be developed, and so they were. These theories ranged from comet and meteorite based theories to proposals linked to volcanic and earthquake activity, to the porosity of the earth’s soil due to large and small particle sizes, to the ways in which certain plants or animal decay within the local environmental settings. But it was the geographic match between Faraday’s observations and theory and the cholera temporal and spatial patterns that naturally gave rise to a new theory to be promoted based on energy-based ideas, not just physical objects or material. 1) Exanthematous, specific disease processes–variola, variolois, varicella, scarletina, measles, erysipelas, erythema, zoster, urticaria (“the itch”), roseola. By the mid-nineteenth century, enough information was gathered for scientists to come to several important conclusions about the earth’s behavior and most importantly the nature of its magnetism. Lawson was most likely one of the many to learn about this particular interpretation of disease patterns, even if it came from a very different writer or reference source. Like any new theory, the miasma theory for all diseases, including those forms of miasma that are not at all physical in nature, came to be a common part of the way that we thought. The birth and rebirth of medical electricity healing gave us reasons to consider the possibility of such metaphysical beliefs. Such a way of thinking would have not only given Lawson a basic understanding of Faraday’s work, but also the insights needed to apply Faraday’s philosophy to that of his own, and develop a new disease theory just a few years later. Two ideas have now developed about the flow of matter and energy over the earth’s surface. There is the traditional Newtonian-based climatic theory regarding how and why the earth revolves around the sun, a philosophy which still holds true for the most part. But this was now accompanied by a new force related to not only the earth and its solar system, but the universe as a whole. Magnetism was that final discovery needed by some groups of scientists to eliminate the questions about God from their textbooks. Such teachings would also lead to new interpretations about nature that conflicted with the Noah’s Flood Theory for major disaster and change. Such reasoning led to new discoveries about the relationships between land masses, and the way in which volcanoes and earthquakes not only occurred in cyclical patterns, but also seemed somewhat predictable at times. 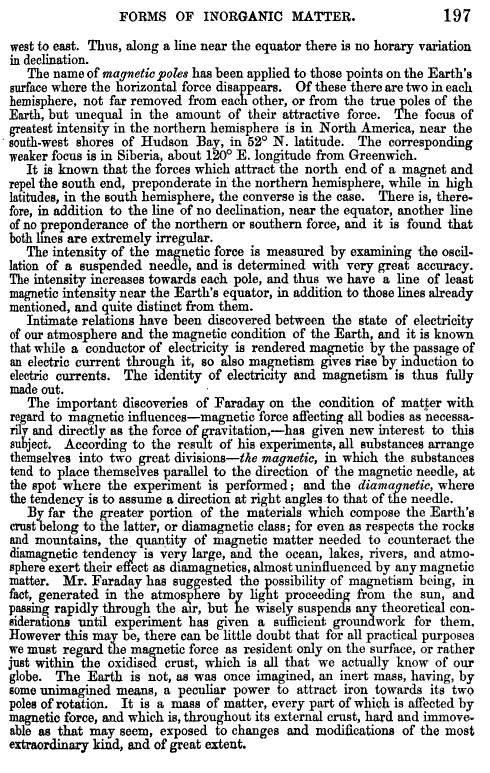 Whenever the equatorial centered theories seemed inadequate for exampling these events, one could turn to Faraday’s Terrestrial Magnetism theory. There is one other somewhat speculative line of reasoning that needs to be presented about Lawson’s earlier experiences in science and medicine. Lawson worked mostly for the military, becoming Inspector-General by the time he would finally publish his conclusions and the reasoning behind his theory. But before this could happen, Lawson had the other medical geographer’s work at hand to peruse. One such famous piece of geographical disease work was that of Alexander Keith Johnston, who was a cartographer, natural sciences expert and geographer, not a physician. Johnston produced a number of basic reference atlases during the 1840s and first half of the 1850s. But like many scientists, was intrigued by the way the deadly cholera epidemics were behaving. These observations coupled with his own reviews of prior German writers and cartographers in the field of medical geography led him to try to stake his own claim to this part of the cartography profession. Johnston added to his many atlas writings a book devoted to just the natural parts of the world, and to the terrestrial elements and events, and the terrestrial-extraterrestrial metaphysical relationships. Johnston’s maps included maps of religion and language, evolution based racial ethnicity patterns, foodways and economic-industrial ways. Johnston also added to Berghaus’s mapping of disease concept, producing his own disease map which depicts Berghaus’s findings along with a number of his own unique findings. 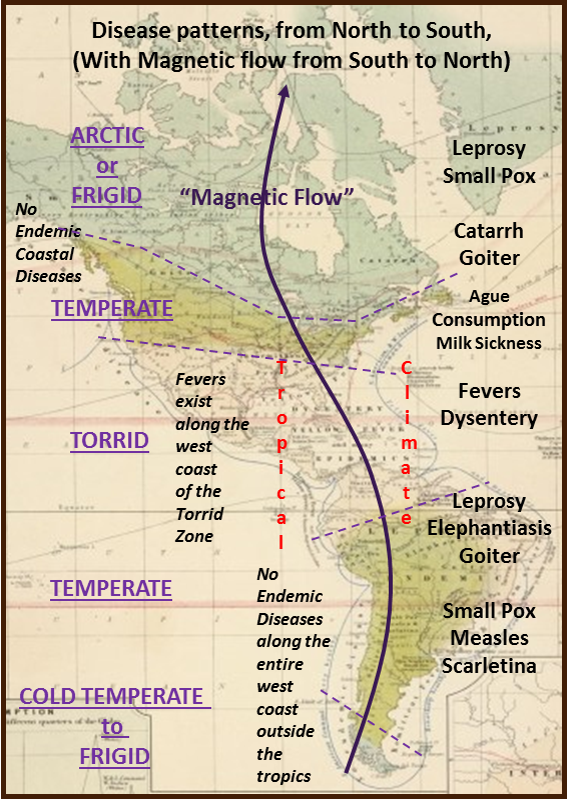 In 1856, when Alexander Keith Johnston produced his global disease map, anyone who believed in the telluric theory for disease could look at this map and see how the telluric theory might be used explain some of the observations that seemed otherwise unexplainable. The above is applied to a section of Alexander Keith Johnston’s map, then relates diseases to Lawson’s theory. Johnston’s map is covered in more detail on another page. This probably reminds some of us of the old adage–maps can sometimes lie. Lawson’s theory developed as a consequence of the studied of the earth’s magnetic poles engaged in by scientists. 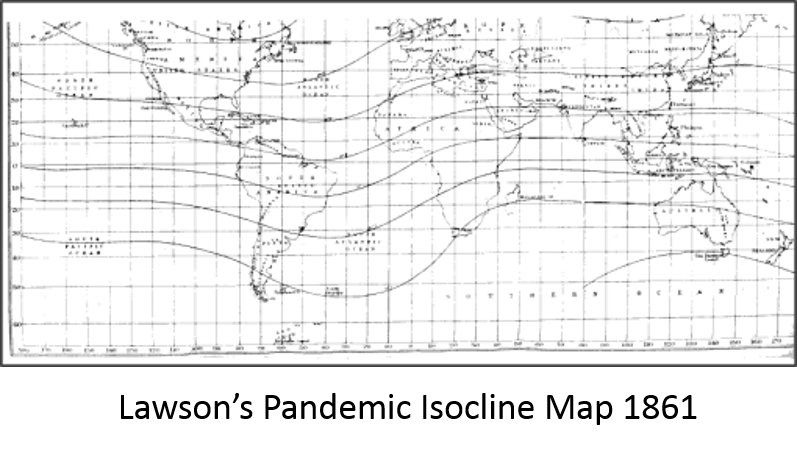 The map that his theory produced was able to merge the zonal climate observations for specific cholera and fever observations and endemic, ubiquitous disease patterns, with the magnetic isoclines teachings. Continuing on the theme for the above rendering of Johnston’s map in relation to Lawson’s philosophy – – there is a repeat in certain distributions, with fevers more varied and distributed in North versus South America. Likewise, cholera (not noted on the map above) struck North America more viciously, impacting just a few major cities in South America. We might expect consumption to be mostly northern (people migrated westward and southward to recover from it in US history, 1800-1880.) Rheumatoid and others afflict both southern and northern hemispheres. 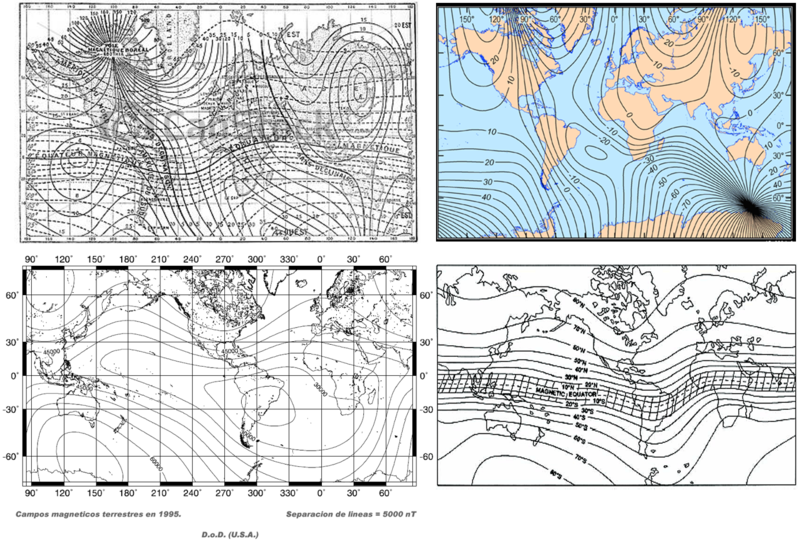 magnetic flow is northward, making northern hemispheric diseases, esp. Cholera and the Fevers worse. North-south hemisphere differences in nature were widely observed during this period of American natural history exploration and documentation. This too would have supported Lawson’s hemispheric differences premise. Northern hemisphere Conifer resins are sticky and never dry completely, southern hemisphere resins are fully drying and non-sticky (copals and dammars), due to a single physical chemical bond lefthand (north)-righthand(south) difference; this is often linked to the coriolis effect and provided further support for Lawson’s magnetic theory during this period of intense copal-dammar industries development. How this played into Lawson’s great discovery of the “Pandemic Waves theory” naturally follows. At the time of Johnston’s publication, Robert Lawson was working as the Inspector-General in charge of maintaining British hospital units around the world. His oversea voyages gave him the opportunities needed to observe the various disease patterns in other countries. A common sense interpretation was all that he needed to relate the varying latitudes and longitudes to northern hemisphere and southern hemisphere disease patterns. 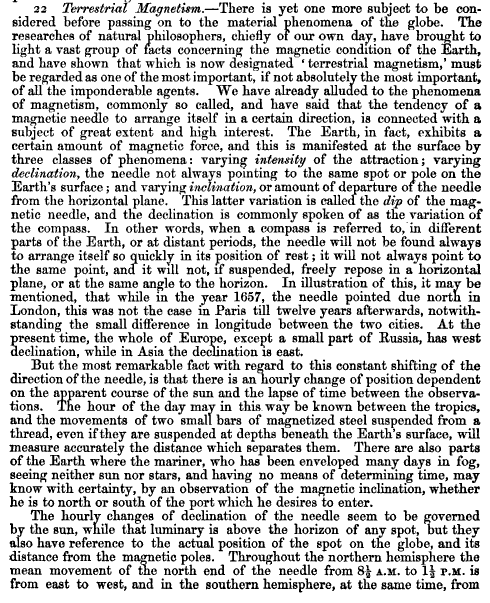 But there were those observations he made that didn’t follow the equator-to-pole flow patterns predicted by the climate latitude theory alone, so he would have taken these opportunities to relate the rules that Faraday’s work implied regarding a possible relationship between certain diseases and the earth’s magnetic pattern. Any maps that were produced as a result of Faraday’s theories were immediately applicable to Lawson’s observations, in particular regarding the behaviors of cholera and fever disease patterns according to his theory. The following is a display of Lawson’s pandemic waves map, as it was originally published (a bit light and somewhat “foggy”), with a map of the earth’s magnetic fields theory as it is currently portrayed. The similarities for these patterns are obvious. 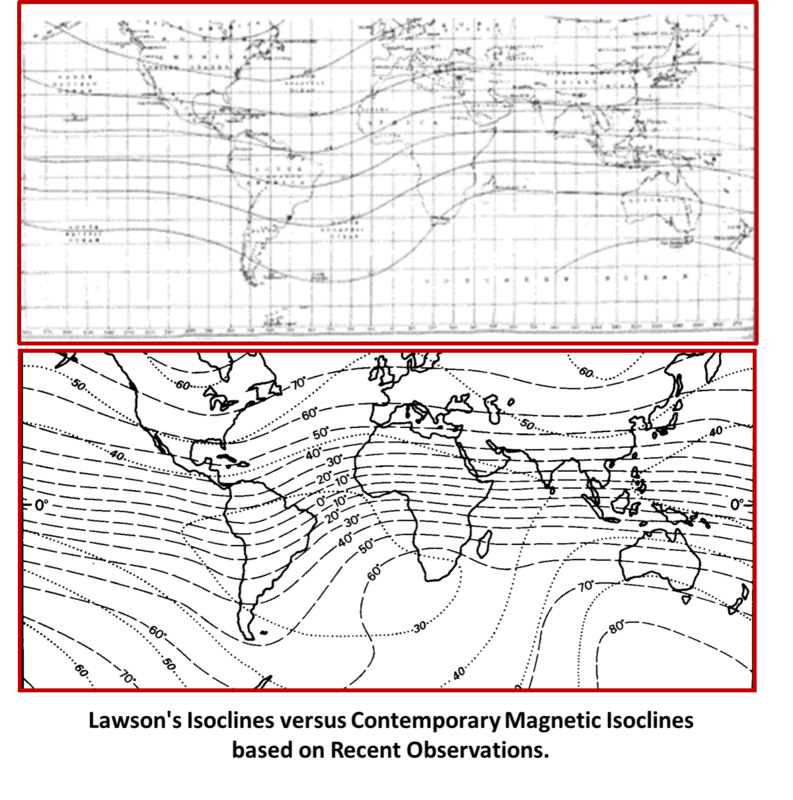 Whereas at first my statements at times seemed speculative, and very much theory based, the similarity of Lawson’s map to the earth’s magnetism map allays such concerns. 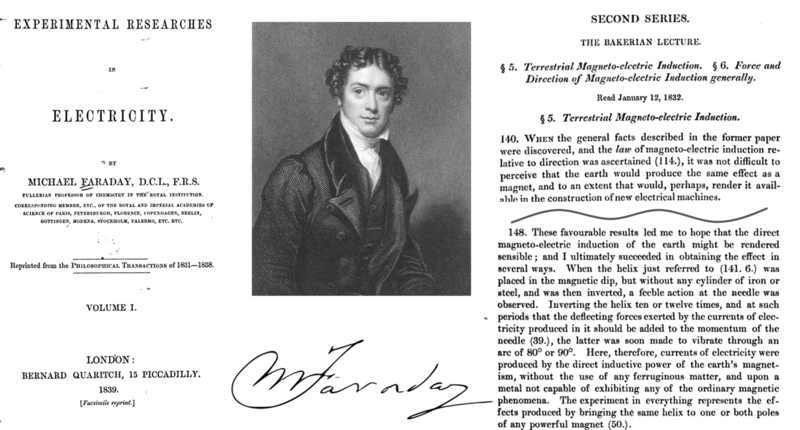 What points out the fact that Lawson’s theory is a direct result of Faraday’s work is the similarity of the two sets of isolines (which only slightly change with time), in particular their troughs and ridges (meteorological terms usually applied to barometric lines). This tells us he based his Pandemic Waves Theory on Faraday’s laws of magneto-electricity for the planet earth, and the isolines map this theory enabled cartographers to produce based on the magnetic pole disturbances. More on this theory will be discussed on another page. In the meantime, see an example of one of Lawson’s published essays on this topic on another page.